The Intermec CS40 has reached end of life. We recommend the Honeywell Dolphin 60s as a replacement option. 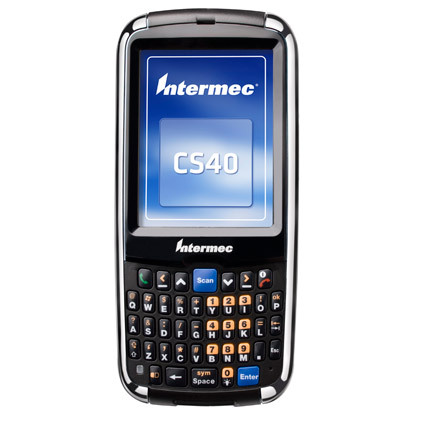 The Intermec CS40 mobile computer gives the power of an enterprise mobile device in a small, lightweight design. 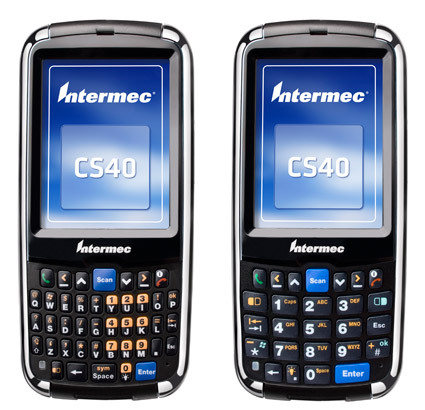 Intermec built the CS40 for mobile workforces including field services, mobile POS, and route management, with a fantastic combination of data capture and communications technologies. Built with a similar form factor to a smartphone, the CS40 fits into most pockets without weighing you down. Scanning barcodes is remarkably easy with the CS40´s built-in EA11 2D imager. The barcode scanner gives you a maximum scan range of up to 15" for retail barcodes, keeping data capture processes moving smoothly. For image capture, such as shipment verification or on-site documentation, the CS40´s 3.2 megapixel camera takes crisp & colorful photos. The mobile computer also ships with your choice of QWERTY or numeric keypad, making manual data entry a snap. The CS40 comes with a variety of communications technologies, fantastic for maintaining connectivity within the four walls or out on the road. An 802.11b/g radio comes standard, providing quick updates while at work sites. On the road, the 3.75G cellular radio and GPS ensure your employees stay in contact and on route. 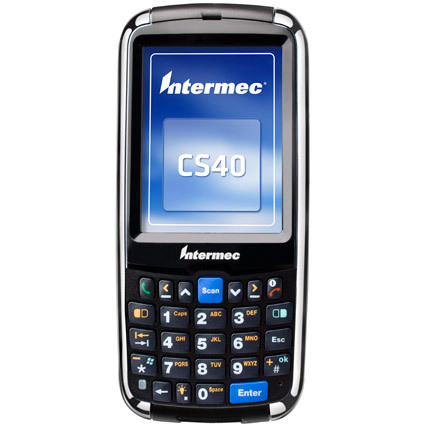 Intermec designed the CS40 to handle the rough abuse and accidental damage that can occur on the road. The reinforced body protects it from drops of 4 feet to concrete while also providing an IP54 seal to prevent dirt & water splashes from harming the internal components. A 3-year warranty comes standard with optional expedited turnaround coverage plans, making the Intermec CS40 a great choice for providing long-lasting peace of mind on the road or in the warehouse. Dimensions (W x D x H): 2.46" x .94" x 5.25"
5.0 Mil Code 39 2.8" to 5.1"
8.0 Mil Code 39 Up to 8.8"
10 Mil Code 39 1.2" to 10.5"
20 Mil Code 39 2" to 17.2"
13 Mil 100% UPCA 2" to 15.2"
7.5 Mil Data Matrix 2.5" to 6.7"
10 Mil Data Matrix Up to 8.6"
15 Mil Data Matrix Up to 11.3"
6.6 Mil PDF417 2.5" to 6"
10 Mil PDF417 Up to 9"
15 Mil PDF417 Up to 14.4"